One of the biggest challenges facing distance runners during the winter is all the snow and ice on their running routes. In some areas it can be so bad that they have no choice but to run on a treadmill, which is what I did just a few days ago. 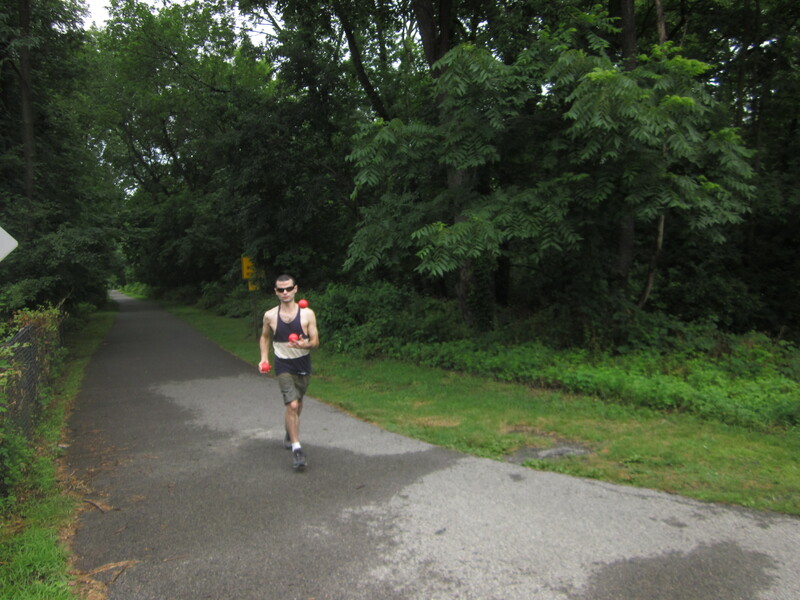 Although I got my “miles” in, it’s really not the same thing as a long run in the outdoors, at least to me. I need to actually go somewhere, I need the fresh air, I need the outdoors, I need the wise guys saying “you can only juggle 3?!”. On the treadmill I felt like the human version of a hamster running on a hamster wheel. So I decided I had to do something to improve my traction when running on snow and ice. 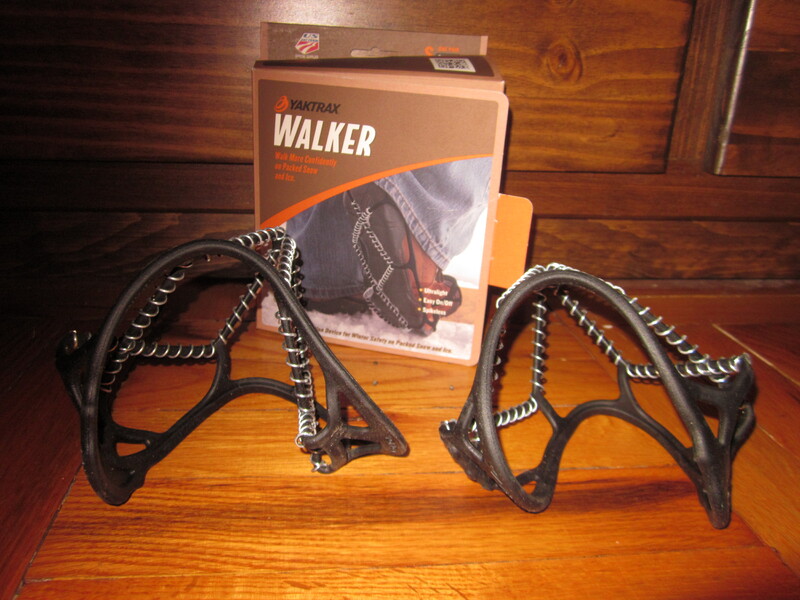 I picked up a pair of the Yaktrax Walker Traction Device at the local sporting good store for $20(for 1 pair), which makes them one of the cheapest traction enhancers. Instead of spikes like other traction enhancers, it uses rings of metal(abrasion resistant 1.2 mm steel coils) around rubber to help improve your traction as you walk or run on snow and ice. It’s very easy to put them on your sneakers. Simply hook the front section of the traction device to the front of your shoe, then stretch it out toward the back to fasten it. It comes in many sizes, XS, S, M, and L, so if you’re looking to buy one make sure you get the right size. Since my sneakers are 8.5, I got a S.
I’ve used them a few times and I immediately noticed an improvement. I am running faster over snow and ice without slipping, even in areas where I would usually slip or slide. I nearly fell in the river last time due to the ice on this hilly stretch of my usual route, but it was like the ice wasn’t there this time, thanks to the Yaktrax. They feel a bit awkward at first, but I quickly got used to them. They are very easy to remove. Sometimes I fear they may slip off if I run in them enough, but nothing like this has happened so far. I hope they last until the end of the winter, if not into next winter. I’ll keep everyone posted on how long they last. 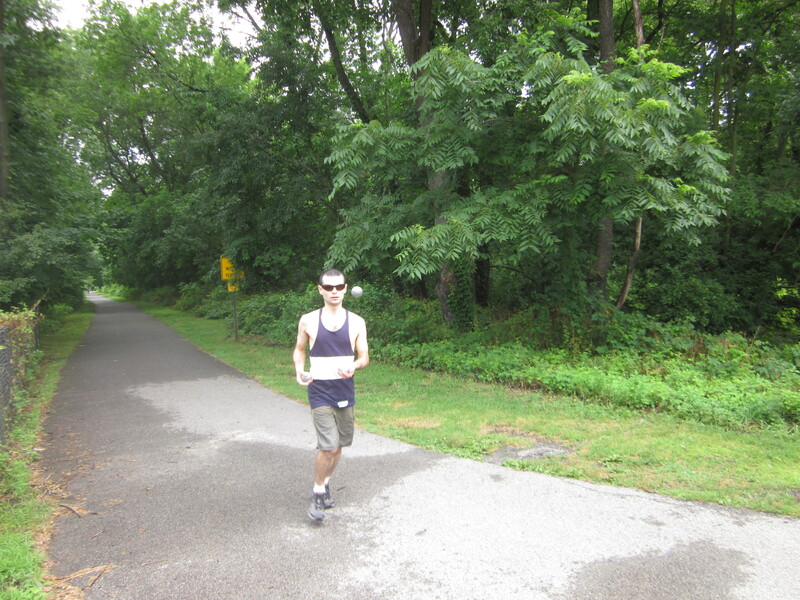 With the right attitude and the right equipment, outdoor distance running is possible is virtually any condition. My new ASICS sneakers in the front, my older New Balance sneakers behind it, and Sauconies in the back. 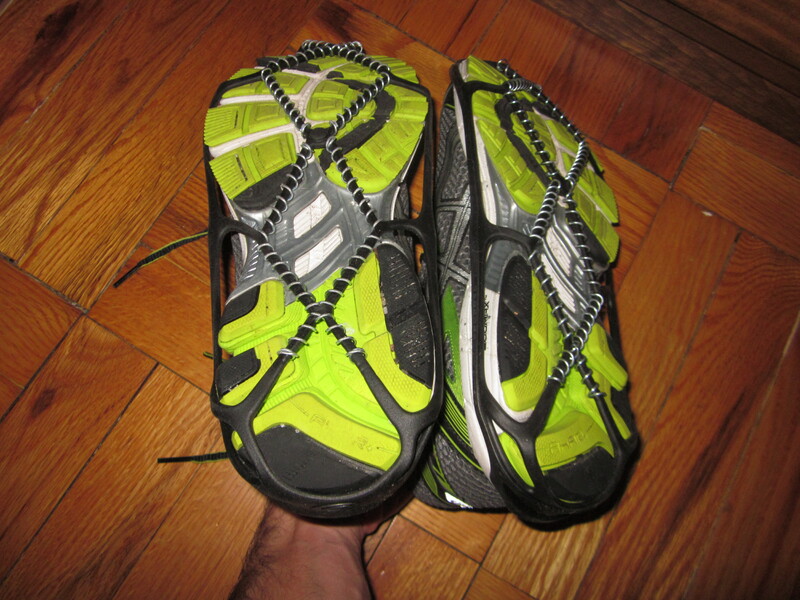 It’s always exciting getting a new pair of running shoes, especially after joggling 13.4 miles(21.5 km) to Valhalla. Almost miraculously, even with the cold heavy winds blowing leaves in my face, and mild nausea and stomach pain during the first half of the run, I didn’t drop the balls even once. It took me 2 hours and 7 minutes to complete this. The stomach issues were likely due to eating too many lentils for breakfast. I may need to join Lentil Addicts Anonymous some day. Anyway, enough bragging. Due to all the running I do(40 – 60 miles a week), I need to get a new pair of sneakers every few months. For a long time I only wore New Balance, then tried out Saucony, and for the first time yesterday bought some ASICS. I kept getting New Balance sneakers for a long time because my feet are kind of wide and their sneakers are usually wider than Nike or most other brands. Saucony is similar enough, and around here are usually cheaper than New Balance so I tried them for a change early this year. I went with the ASICS this time because they had the exact size(8 1/2) I needed in wide. Neither Saucony, New Balance or any other brands had what I was looking for. I am not a particularly brand loyal kind of person, so I frequently switch brands when it comes to shoes, clothing, food and many other things. I don’t think there are big differences in quality when it comes to different brands of running shoes, in my experience. Also, a higher price tag doesn’t necessarily mean the sneaker is better. I used to wear a size 8(the Sauconies in the above photo is an 8), but it kind of felt a little too small for me, so I’ve been wearing 8 1/2 since. There isn’t a whole lot of science when it comes to running shoes, except that you are better off buying sneakers in the evening because your feet tend to be bigger then than in the morning. 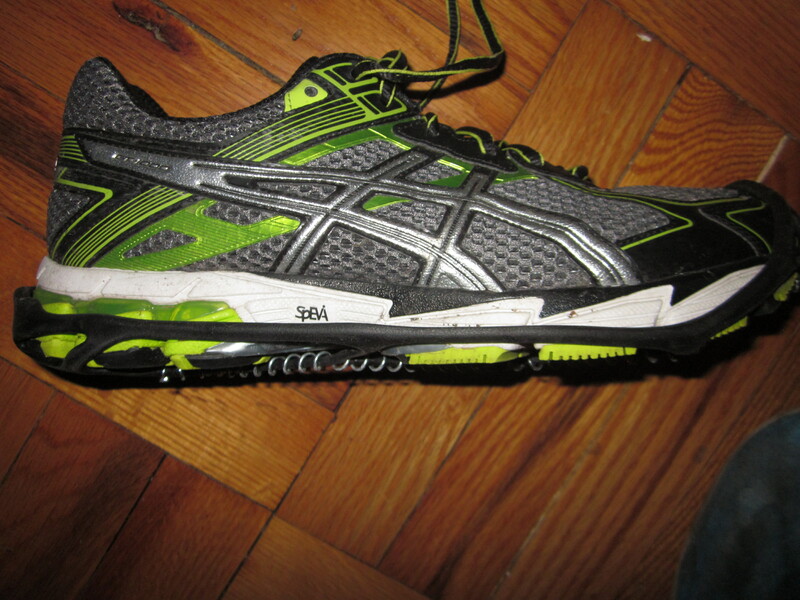 I went shopping for mine in the afternoon, and so far the ASICS feel okay, but need to be broken in a little more. 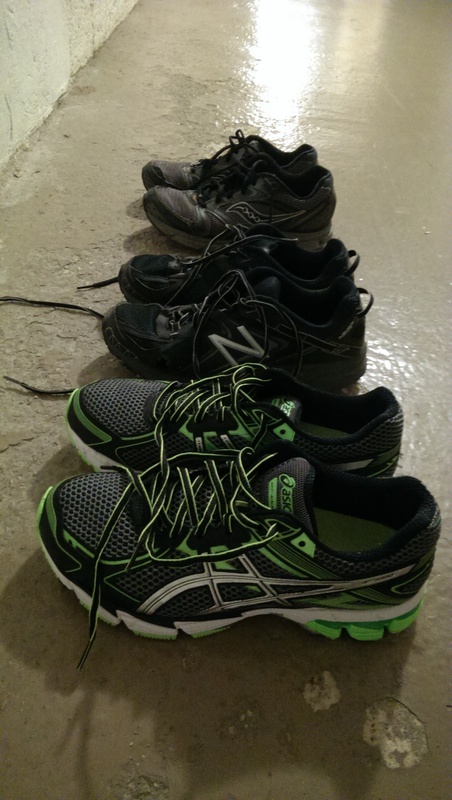 I will still use the 8 1/2 New Balance sneakers occasionally(they are my Valhalla sneakers after all), for short runs or walks, but I think it’s about time I got rid of the older Sauconies. I hope I get used to the ASICS within a week. In Valhalla after run. 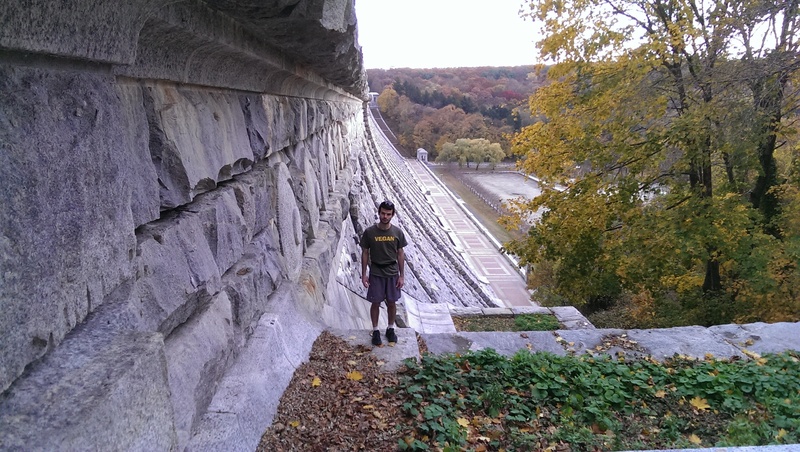 The Kensico Dam is behind me. Are push-ups on unstable surfaces more beneficial? Push-ups are one of the best strength training exercises. You can do them almost anywhere and they require no special equipment. While they target the chest(pectoral) muscles, they also exercise the shoulder(deltoid), arm, and ab muscles. There are many variants of the push-up. In particular, a recent trend is doing push-ups on unstable surfaces using BOSU balls or T-Bows. According to the companies that sell these products and some of their devoted users, this improves the push-up so that it is more beneficial. But is there any validity to this? The addition of unstable surfaces in push-up training does not provide greater improvement in muscular strength and endurance than push up training performed on a stable surface in young men. In other words, don’t waste your money on this fancy equipment. The unstable surface provided no extra benefit. 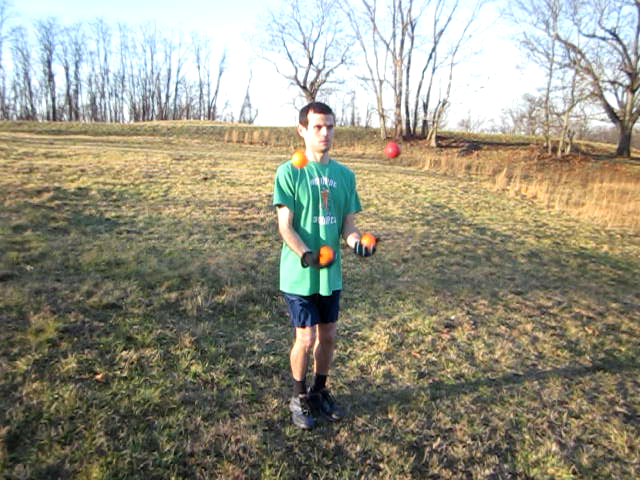 One of the many things a lot of jugglers(and jogglers) have in common is finding ways to juggle any time, any place, and in any situation. While showering, while eating, you name it. It can be that addictive. But like many healthy habits, it’s a good addiction. It’s the main reason many of us took up joggling in the first place. For obvious reasons, it isn’t easy joggling at night(unless you’re a cat), even in areas where running is easy. 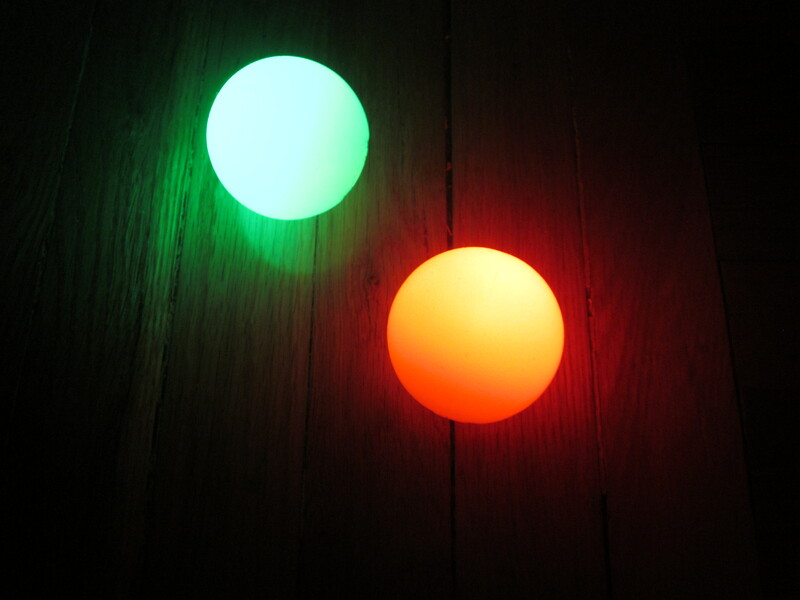 One solution is to use LED light balls, like the ones made by Nite Ize. About the size of a tennis ball, they bounce and are also well-built from durable rubber. The 2 easily replaceable 2016 3V lithium batteries are in the sturdy, removable core. Just remove the large plug, which doubles as an on/off button to get access to the batteries to replace them. The balls are about 4.8 ounces and have a rough exterior which makes them easier to grasp. Press down the on/off button for two seconds to turn them on, and do the same thing to turn them off. It takes a good deal of pressure to turn them on, which is good, since if you drop them there is little chance of them getting accidentally turned on or off. 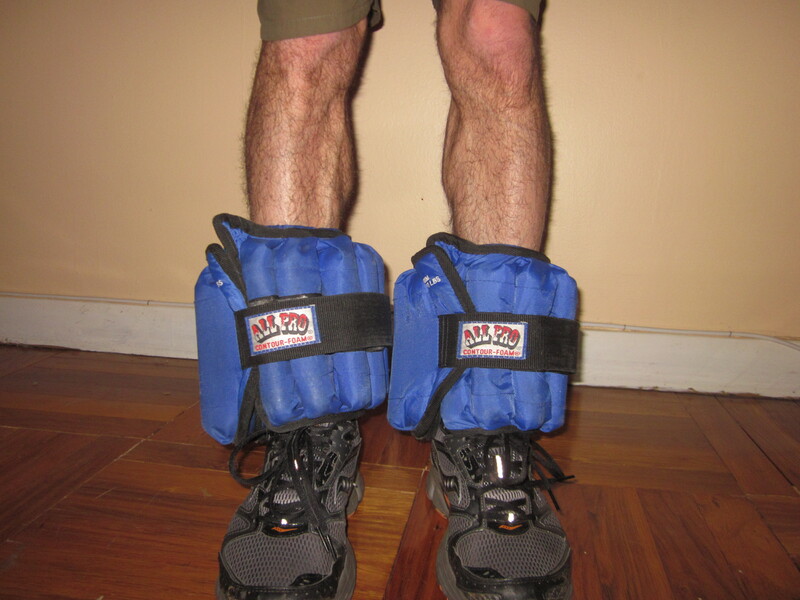 They are great for joggling at night so as long as it is not too dark and you are familiar with the terrain. 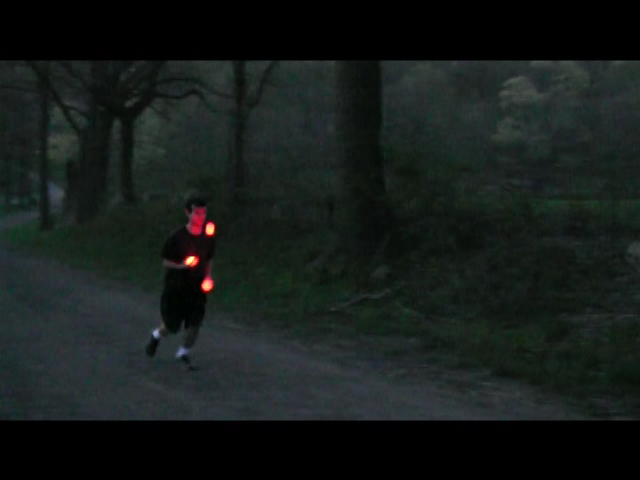 If conditions are very dark, juggling the balls while running will produce a blinding glare that will obscure your vision to the point that you can’t see what’s ahead. So be careful. 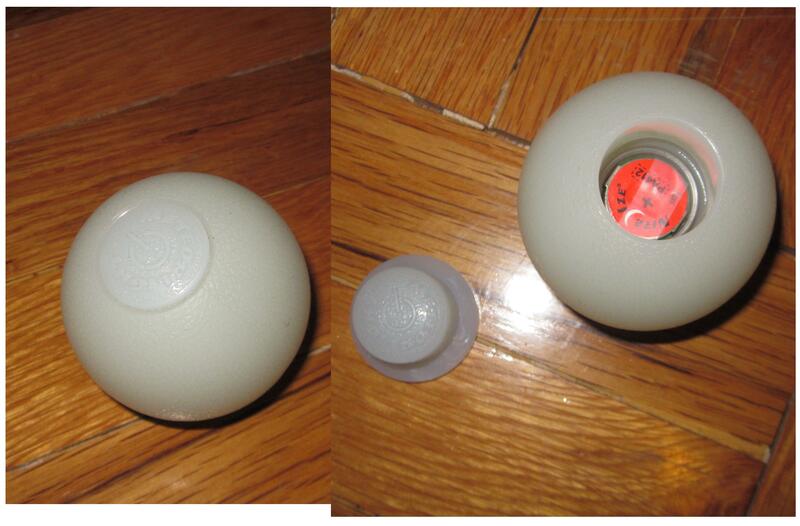 This same exact product is also sold as a ball(with different packaging) for playing with your dog at night. They are water resistant, and come in 3 colors – red, green, blue, and there is also a color changing model. Their price is reasonable, and I didn’t get mine for free. I’ve had these awesome orbs for several months, and although I don’t joggle with them very often they seem to be holding up pretty well. Compared to other light-up juggling balls, these seem to be built to last. 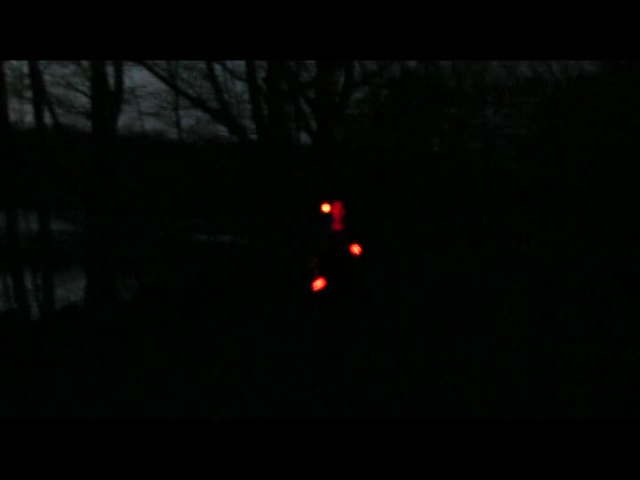 The children in my area can’t get enough of these LED balls and seem to think I’m an alien from another planet when I joggle them in the park or along the streets at night. The light these things produce is only visible in a dark room or at night. They have some bounce, but I do not recommend these for bounce juggling unless you really know what you are doing. LED technology just keeps getting more fun! With the sun’s rays getting stronger and the days getting longer and warmer, the outdoors are calling out your name and telling you to come out and play. I believe that outdoor exercise is generally more beneficial than indoor, so this is a good thing. 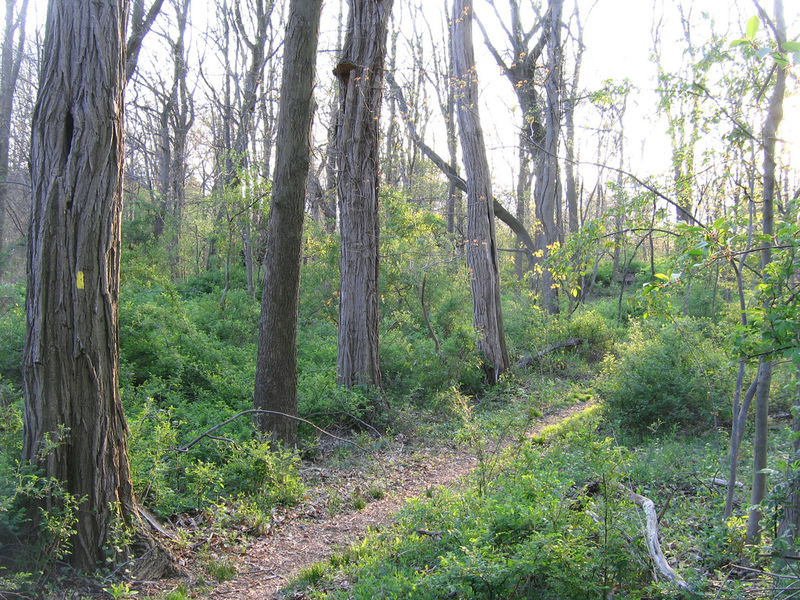 However, one of the biggest downsides to outdoor exercise is the damaging effects of sunlight on the skin and eyes. Lack of proper eye protection can lead to permanent eye damage in the long-term, besides hindering athletic performance in the short-term. Luckily, all you need is a good pair of sunglasses to protect your eyes – with all the choices out there, choosing the right one can be difficult. 1) Make sure they cover up enough of your eyes. Very small circle sunglasses may look “hip” to some people, but they don’t block enough sunlight from the side or the top. Wrap-around sunglasses are your best choice, since they block sunlight from all directions. 2) Make sure they provide enough darkening for very bright sunlight. Polarized glasses may be better for reducing glare and seeing things in water when the sun is out, but they are not absolutely necessary. Brown-orange lenses are probably the best color, along with brown-red, and brown-yellow. Grayish lenses are good as well. Pure red, green, or blue lenses aren’t a good idea since they can distort your vision. 3) Make sure they provide 100% UV light protection. This is different from how dark the lenses make your vision. Even some dark lens sunglasses can provide poor UV protection while some lighter ones provide 100% UV protection. UV light can damage your eyes over time, leading to macular degeneration and other serious problems. How can you tell if your sunglasses provide 100% UV protection? One important thing to keep in mind is that price is no guarantee of UV protection. I’ve tested very expensive sunglasses and realized they provided little UV protection(even though the labels claimed they provided 100%), while some relatively cheap ones($8 to $25 U.S dollars) provided 100% UV protection. 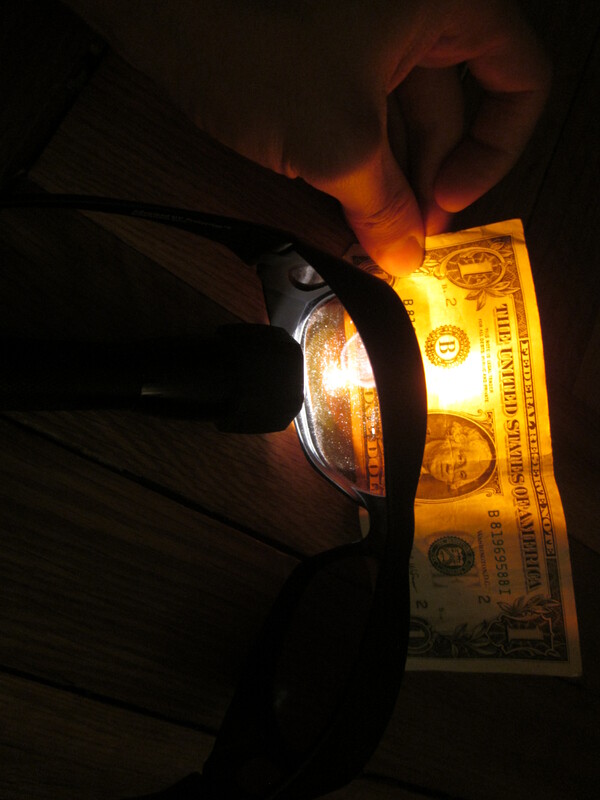 Go into a dark room with the UV flashlight, the sunglasses, and with paper money and/or a credit card. Turn on the UV light and beam it on the paper money. You should notice all these mysterious symbols on the money(usually a line) or credit card(usually letters) you normally wouldn’t see in ordinary light. These are watermarks used by banks and government officials to detect counterfeit money – these lines and/or symbols are only noticeable in UV light. Don’t worry, you are not doing anything illegal! Now take the sunglasses you wish to test, and beam the UV light through one of its lenses and onto the money or credit card. – If you still see the symbols on the money or credit card, your glasses do not provide 100% UV protection(the lenses are letting through the UV light and revealing the symbols). – If you do not see the symbols, your glasses have passed the test and do provide 100% UV protection – the lens blocks the UV, hence you can’t see the symbols. I’ve done this test many many times over the years, and discovered that many expensive sunglasses belonging to friends and family(so disappointed!) do not provide 100% UV protection while some inexpensive ones did provide 100% UV protection. Granted, many expensive ones do provide 100% UV protection, and some cheap ones do not, but do not let price be your guide. And unfortunately, there is little regulation of sunglasses and labelling can be dishonest. If the glasses fail the test, make sure you return them and get a refund as quickly as possible. If it’s at all possible, see if you can even test sunglasses at the store. Now get out and enjoy the early spring! 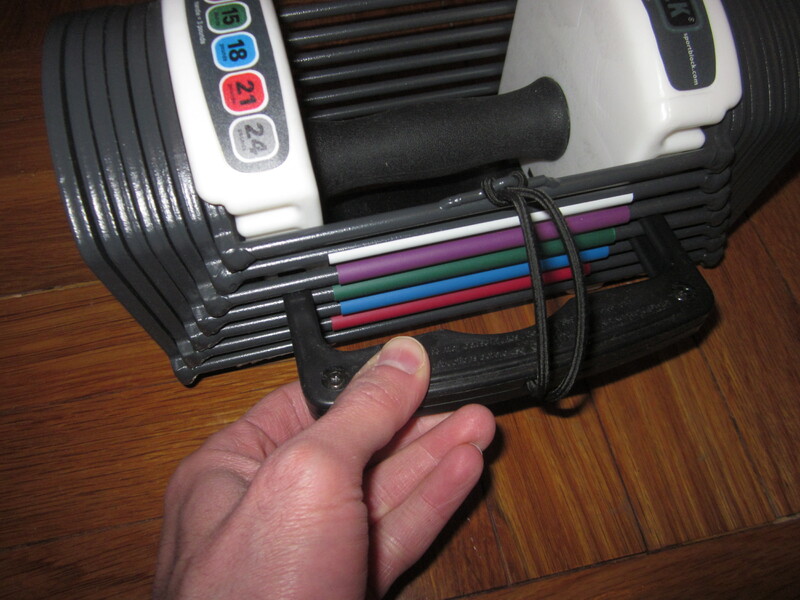 I already mentioned how I use resistance bands for strength training, using them primarily for upper body exercise, while also doing push-ups, and bicycle crunches. Use a walker to do dips: Just like the dip bars at the gym, you can use a walker to do the same thing. Great for improving upper body strength. Juggle with heavy balls: These balls are tennis balls that were stuffed with pennies and sealed shut with epoxy and duct tape. Not only do they help strengthen the muscles used for juggling, their weight may also make a deeper imprint on muscle memory so that I juggle better. They weigh 1 pound each, which isn’t much but after several minutes it does get tiring. 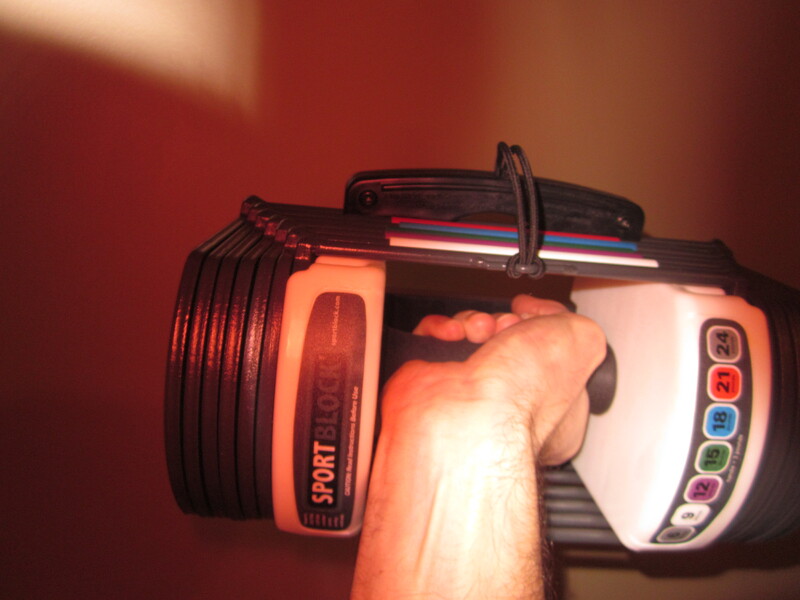 Ankle weights: A necessity for building strength in the legs for runners. But they shouldn’t be used while running, that can increase the risk of injury. This is the All-Pro brand, I’ve had them for almost 10 years and they have served me well. 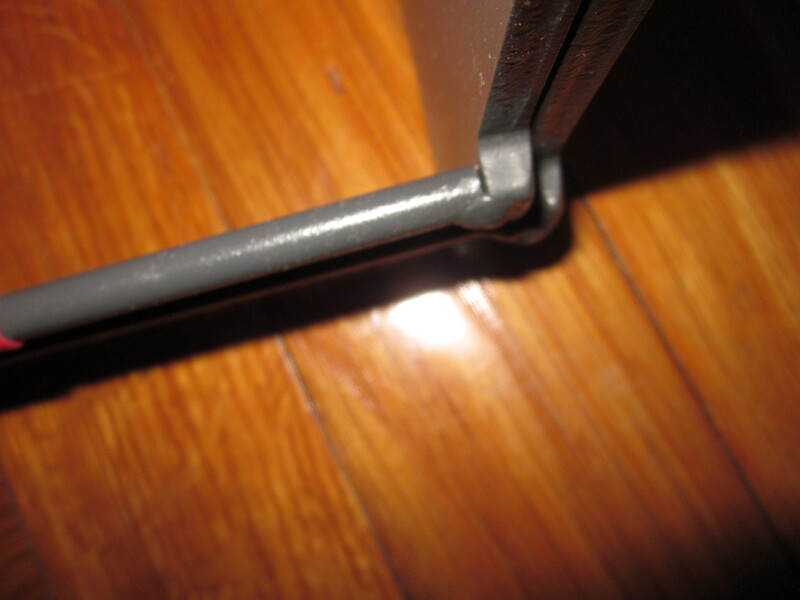 The velcro has deteriorated a bit unfortunately, but it’s not a major problem. Medicine ball: This helps build explosiveness, especially when you throw it. You can also do a variety of lifts with this to help build ab muscles. 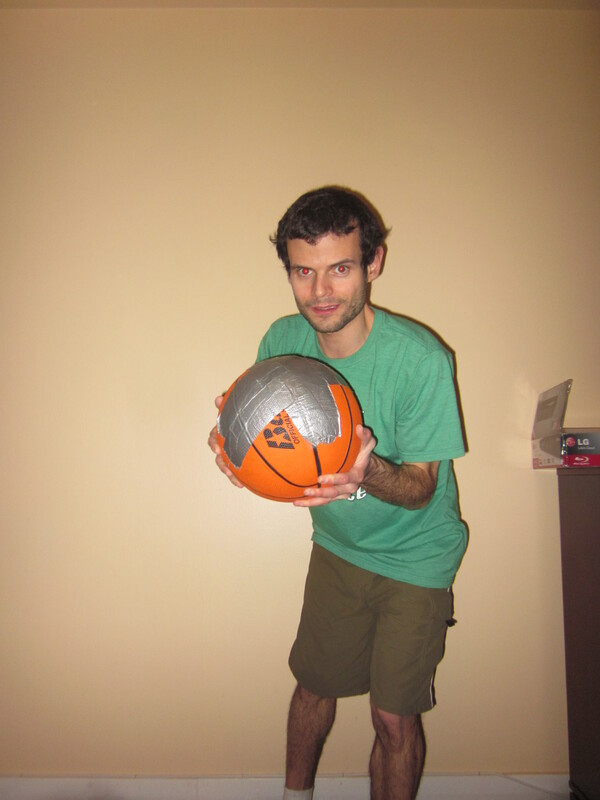 I made this myself, it’s just a basketball full of sand. It weighs about 23 lbs. 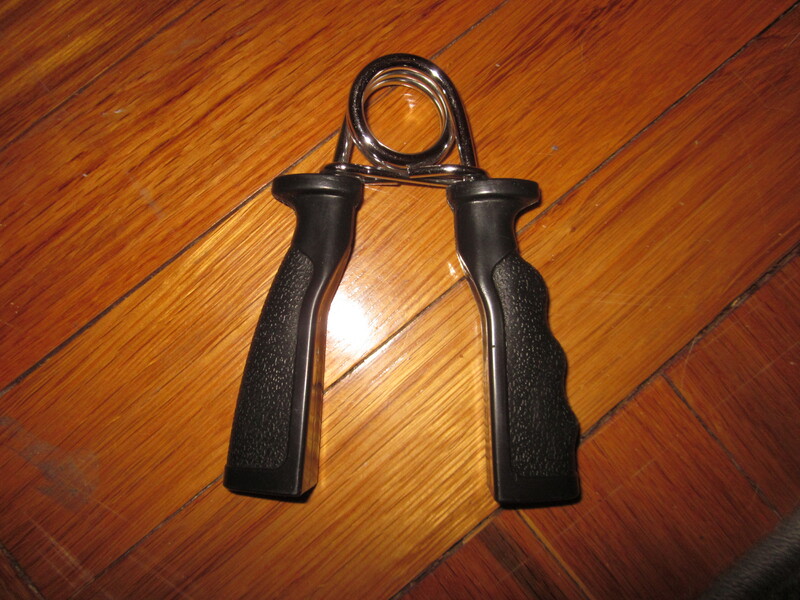 Hand exerciser: Jogglers need to have strong hands! 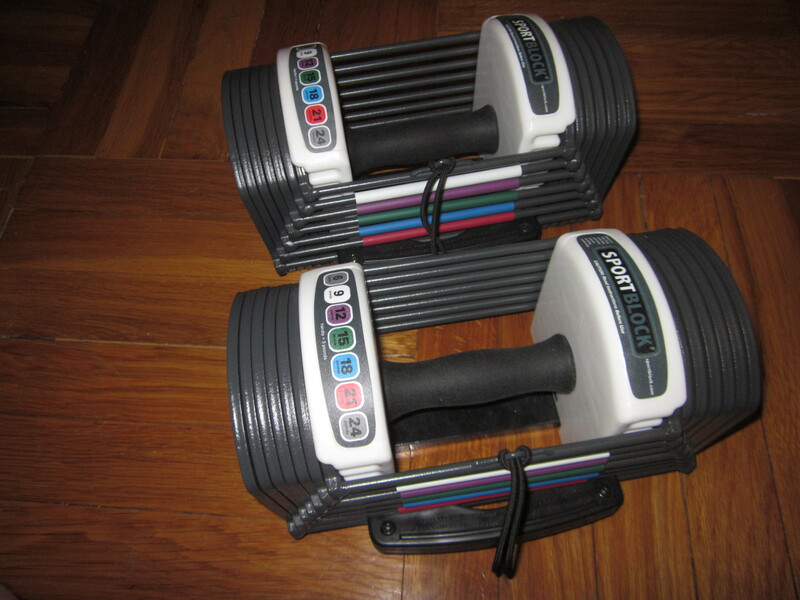 If anyone has any recommendations for equipment or strength-training exercises, please let me know.